One of the most distinctive features of The Santa Anita Church is the beautiful Tower of Light. It was designed by noted stained glass artist John Wallis, then of Wallis, Wylie and Associates. God had chosen well. Mr. Wallis was originally a painter, received his training in the art of stained glass as a member of the noted Boston firm of Wilbur Herbert Burnum. He worked for ten years on the Cathedral of St. John the Divine in New York City. 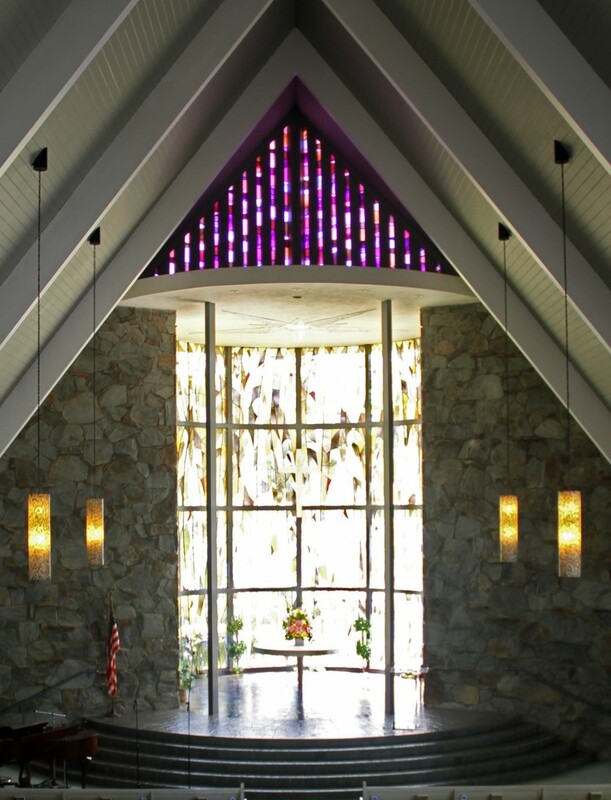 After creating the Tower of Light, he went on to design the stained glass for the churches of Religious Science in Glendale and Redondo Beach. 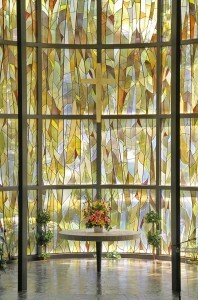 He is nationally known for his work on the stained glass at the Pearl Harbor Memorial and the west wall of St. Andrews Cathedral in Honolulu, one of the largest stained glass windows ever made. In the late 1990’s, Reverend Mary Mitchell was able to interview John Wallis, then 92 years old, at his home in Sierra Madre. He described his work on the Tower of Light as his most enjoyable experience. He loved working with Reverend Barnhart; he said he felt a mystical connection with her. Asked if he found the tower difficult, he used instead the word, “worrisome.” The Tower is circular, but made entirely of flat, antique (hand made) glass. It was challenging to create a design that would fit the circular form using flat glass. He evidently built well. The Tower has survived several nearby earthquakes. Today, as one enters this beautiful sanctuary and looks toward the golden glass Tower of Light, the heart is still filled with the glory and wonder of light Mr. Wallis spoke of. The pure white circular altar table, together with the lotus mosaic on its top, symbolizes the awakening of man to the realization of his oneness with God. Above the altar, in the ceiling of the Tower of Light, is the five-pointed Star of Bethlehem, which marked the place where the Divine came forth into human expression through the birth of Jesus Christ. Hanging from the center of the star, the cross of the Risen Christ is resplendent with its own light and power, compelling one to look up, not only physically, but also mentally. The Tower of Light is symbolic of the cycle of the unfolding of God’s pattern for man, taking place within the circle of God’s light.